If preaching is to be primary, it demands a certain kind of preaching, specially, biblical preaching. To this end, Lloyd-Jones and MacArthur have been known for their expository pulpits, a fundamental approach that involves long series through entire books in the Bible. Whether preaching verse-by-verse through whole books, or through sections within books, both men have used the lectio continua approach, meaning “continuous expositions.” This comprehensive modus operandi has served a balanced diet to their well-balanced congregations. By this approach, Lloyd-Jones delivered over 4000 sermons from his Westminster pulpit, preaching twice on Sundays, once in the morning and once in the evening, and on Friday evenings (September to May). Further, he conducted regular journeys throughout the English countryside, preaching at least two to three times during the week, including numerous pastors’ conferences. 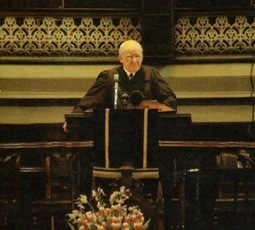 Lloyd-Jones’s Sunday morning sermons were intentionally directed towards Christians. From his Westminster pulpit, he preached through: 1 Peter (twenty-five sermons, 1943-1944), 2 Peter (twenty-five sermons, 1946-1947), Philippians (thirty-seven sermons, 1947-1948), 1 John (sixty-seven sermons, 1948-1950), and Habakkuk (six sermons, 1950). The most famous Sunday morning series by Lloyd-Jones was the Sermon on the Mount, a thorough treatment of Matthew 5-7 (sixty sermons, 1950-1952). Other Sunday morning series included an exposition of John 17 (thirteen sermons, 1952-1953), Psalm 73, (eleven sermons, 1953), Spiritual Depression from Psalm 42 (twenty-one sermons, 1954), Revival (twenty-six sermons, 1959), Ephesians (260 sermons, 1954-1962), Colossians 1 (fourteen sermons, 1962) and the Gospel of John chapters 1-4 (1962-1968). In the Sunday evening messages, Lloyd-Jones was purposefully evangelistic, preaching through: Isaiah 35 (six sermons, 1946), Isaiah 40 (nine sermons, 1954), Psalm 107 (seven sermons, 1955), Authority (three sermons, 1957), Galatians 6:14 on the Cross (nine sermons, 1963), Psalm 1 (four sermons, 1963), Isaiah 1 (nine sermons, 1963), Isaiah 5 (seven sermons, 1964), Joy Unspeakable (twenty-four sermons, 1964-1965), and Acts 1-8 (110 sermons, 1965-1968). In addition, Lloyd-Jones started a Friday night Bible study, early in his Westminster ministry, focused primarily upon Christians, an on-going series which became enormously popular. His first Friday night series was on Great Doctrines of the Bible (eighty-one sermons, 1952-1955). Far from being dry lectures, these messages were delivered with all the elements of dynamic preaching. This series was followed by his magisterial exposition of the book of Romans (372 sermons, 1957-1968), culminating in Romans 14:17, when he retired from the Westminster pulpit. Like Lloyd-Jones, MacArthur made the same commitment to expository preaching. He writes: “Preaching and teaching must be expositional, setting forth as clearly, systematically, and completely as possible the truths of God’s Word and only those truths.” MacArthur emphatically asserts: “It is for that reason that expository preaching—preaching that systematically and thoroughly explains the meaning of Scripture—is the only legitimate way to preach.” Consequently, he states that the message must never originate with himself: “The preacher’s responsibility is not to create messages from his own wisdom or cleverness or to manipulate or sway his listeners by means of his own persuasiveness of charisma but to interpret, explain, and apply God’s Word as clearly and completely as possible.” This is the genius of MacArthur’s preaching. Starting at the first verse of chapter one and moving consecutively through the entire book, he simply reads, explains, and applies God’s Word. MacArthur is a mouthpiece for the biblical text. In all, MacArthur has delivered some 3,000 expositions at Grace Community Church. For over forty years, he has stood in one pulpit and faithfully expounded the Scripture, Sunday by Sunday. On Sunday mornings, MacArthur has preached, verse by verse, through: Romans (1969), the Gospel of John (seventy-eight sermons, 1970-1972), Acts (103 sermons, 1972-1975), 1 Corinthians (eighty-one sermons, 1975-1977), Ephesians (sixty sermons, 1978-1979), the Gospel of Matthew (226 sermons, 1978-1985), 1 Timothy (fifty sermons, 1985-1987), 2 Timothy (twenty-seven sermons, 1987-1988), Philippians (forty-six sermons, 1988-1989), 1 Thessalonians (thirty-six sermons, 1990-1991), Philemon (four sermons, 1991), 2 Thessalonians (seventeen sermons, 1992), Titus (twenty-four sermons, 1992-1993), 2 Corinthians (ninety-six sermons, 1993-1998), the Gospel of Luke (298 sermons, 1998-2008), the Gospel of Mark (2009-2011). On Sunday evenings, MacArthur has likewise expounded: Habakkuk (three sermons, 1969), 1 and 2 Peter (1969), Hebrews (forty-three sermons, 1972-1973), Galatians (twenty-four sermons, 1973-1974), Colossians (twenty-three sermons, 1976), Zechariah (nineteen sermons, 1977), Daniel (thirty-one sermons, 1979-1980), Romans (124 sermons, 1981-1986), James (thirty-four sermons, 1986-1987), 1 Peter (fifty sermons, 1988-1990), 2 Peter (twenty-seven sermons, 1990-1991), Revelation (eighty-seven sermons, 1991-1995), Genesis 1-11 (forty-nine sermons, 1999-2001), 1 John (forty-two sermons, 2002-2003), 2 John (four sermons, 2003), 3 John (two sermons, 2003), Jude (fifteen sermons, 2004). In addition, MacArthur has also preached the following topical expository series: The Superiority of Christ (seven sermons, 1972), The Second Coming of Jesus Christ (twenty-three sermons, 1973), Is the Bible Reliable? (twelve sermons, 1974), God, Satan, and Angels (nine sermons, 1975), The Charismatic Movement (twelve sermons, 1977), Spiritual Bootcamp (four sermons, 1978), True Worship (eight sermons, 1982), The Anatomy of a Church (eight sermons, 1983), Heaven (eight sermons, 1987), Spiritual Growth (four sermons, 1988), Seven Steps to Spiritual Stability (six sermons, 1989), Whatever Happened to the Holy Spirit? (six sermons, 1989), The Love of God (six sermons, 1994-1995), The Fulfilled Family (eleven sermons, 1996), A Biblical Perspective on the Middle East and Terrorism (four sermons, 2001), The Doctrines of Grace (ten sermons, 2004), Spiritual Terrorism (ten sermons, 2004), Making a Case for the Bible (five sermons, 2006), Why Every Calvinist Should be a Premillennialist (six sermons, 2007), The Kind Of Worship God Desires (five sermons, 2008), Romans chapters 3, 4 and 5 (ten sermons, 2009), Hebrews 11 (twelve sermons, 2009-2010), 1 Corinthians 13 (four sermons, 2010), 1 Corinthians 15 (six sermons, 2010). Journal Article written by Dr. Steven Lawson (used with permission). Flowing out of their common recognition of biblical authority is a second striking similarity, namely, their strict commitment to the primacy of biblical preaching. Though both men have faced demands on many fronts, they, nevertheless, are, first and foremost, preachers of the Word. In their ministries, the public exposition of Scripture occupied the central place. For both men, the pulpit was the principle means by which they exerted their greatest influence. By all accounts, the Westminster pulpit was central to every aspect of the spiritual life of the church. Accordingly, Lloyd-Jones maintained that preaching is the loftiest task to which anyone could commit himself. He writes, “The work of preaching is the highest and the greatest and the most glorious calling to which anyone can ever be called.” What is more, Lloyd-Jones insists: “The most urgent need in the Christian church today is true preaching; and as it is the greatest and the most urgent need in the church, it is obviously the greatest need of the world also.” Nothing, he maintained, must ever supplant the primacy of the pulpit in the church. Lloyd-Jones came to this conviction early as a brilliant young physician. He came to the sobering realization that he was merely assisting the physical healing of people who would return to godless living and suffer eternal destruction. He lamented, “We spend most of our time rendering people fit to go back to their sin.” Of his patients, he realized: “A man with a healthy body and a diseased soul is all right for sixty years or so and then he has to face an eternity of hell.” Once converted, Lloyd-Jones came to see that only the Word of God can bring about what ultimately matters, the healing of eternal souls. With this conviction, he was being drawn to the ministry of preaching: “The primary task of the Church and of the Christian minister is the preaching of the Word of God.” Everything in the church, he believed, should be shaped and influenced by the pulpit. 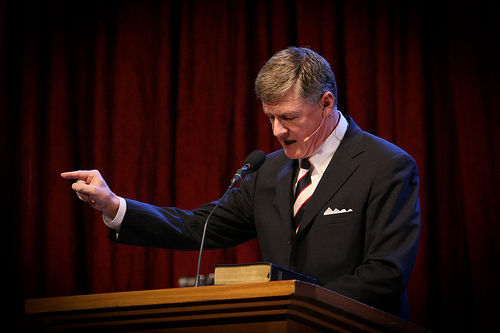 Substantiating this claim, Lloyd-Jones pointed to the earthly ministries of Jesus Christ: “In the life and ministry of our Lord Himself, you have this clear indication of the primacy of preaching and of teaching.” In addition, he understood that Christ assigned this same priority to His apostles. When these men were “filled with the Holy Spirit on the Day of Pentecost,” he notes, they immediately “began to preach.” As other needs arose in the early church, Lloyd-Jones paraphrased Peter’s assertion, stating: “We are here to preach this Word, this is the first thing, ‘We will give ourselves continually to prayer and the ministry of the Word.’” By this statement, he maintained that preaching, empowered by prayer, is job number one in the church. He states that these “priorities are laid down once and forever…and we must not allow anything to deflect us from this.” No other ministry or church activity must ever supplant the primacy of the pulpit. Standing shoulder to shoulder with Lloyd-Jones, MacArthur has voiced this same conviction: “The church’s most important function is to proclaim the Word of God in an understandable, direct, and authoritative way.” Assigning the pulpit this proper place, MacArthur declares: “Preaching the Word must be the very heart of our ministry philosophy.” Resisting present day trends, he emphatically states: “In corporate worship, the preaching of the Word should take first place.” Therefore, MacArthur maintains: “Preaching is an irreplaceable aspect of all corporate worship. In fact, the whole church service should revolve around the ministry of the Word. Everything else is either preparatory to, or a response to, the exposition of Scripture.” At Grace Church, the centrality of the Word preached is an irrefutable core value. MacArthur is indefatigable in this fundamental commitment: “Preaching is the non-negotiable heart of the church’s ministry. This fact does not change because public opinion changes.” MacArthur states that this biblically-assigned priority in non-negotiable: “Some people today argue that the church could draw more ‘unchurched’ people by featuring drama and music instead of preaching. But Paul’s instructions to Timothy were clear. He was to preach the Word whether preaching was popular or not—‘in season and out of season.’” Thus, MacArthur sounds this clarion warning: “A ‘church’ where the Word of God is not regularly and faithfully preached is no true church.” Only where the Scripture is rightly expounded, he believes, does a true church meet. The similarities between Lloyd-Jones and MacArthur begin with their unwavering commitment to the authority of Scripture. Both these pulpit stalwarts have strongly affirmed the sovereignty of Scripture over the life of the church and every individual. For both men, the Bible is, indisputably, the inspired, inerrant, and infallible Word of the living God, fully sufficient to accomplish God’s purposes upon the earth. Herein lies the underlying genius for their powerful expositions. With unshakable certainty, Lloyd-Jones asserts that “the Scriptures are a divine product breathed out by God.” He maintains, “They were produced by the creative breath of the almighty God.” “It is not merely that the thoughts are inspired, not merely the idea,” Lloyd-Jones contends, “but the actual record, down to the particular words.” Regarding the divine inspiration of Scripture, he states, “The Holy Spirit has thus overruled and controlled and guided these men, even in the particular words, in such a way as to prevent any error, and above all to produce the result that was originally intended by God.” With deep conviction, Lloyd-Jones insisted that the Bible is the very breath of God, and that it speaks with perfect accuracy and divine authority. To this point, Lloyd-Jones affirms: “This subject of authority is indeed the great theme of the Bible itself. The Bible presents itself to us as an authoritative book.” The Doctor adds, “The authority of the Scriptures is not a matter to be defended, so much as to be asserted…it is the preaching and exposition of the Bible that really establish its truth and authority.” “The Scriptures themselves claim that authority”, Lloyd-Jones asserts. “They come to us as the Word of God…You cannot read the Old Testament without feeling that everywhere there is the assumption that this is the Word of God.” He further notes, “Our Lord Himself fully accepted that position. How often does He say, ‘It is written’! And He directs men to that as the final authority. He meets the attack of Satan by quoting Scripture.” Only when the Scripture is held to be supremely authoritative can the preacher wield the sword of the Spirit with power. Regarding the Old Testament, Lloyd-Jones writes: “To the Lord Jesus Christ, the Old Testament was the Word of God; it was Scripture; it was something absolutely unique and apart; it had authority which nothing else has ever possessed nor can possess.” Similarly, this distinguished preacher recognizes this same authority in the New Testament: “The authority of the apostles undergirds and underlies the authority of the Gospels and the Epistles, the Book of Acts, indeed the whole of the New Testament. And we either accept that or we do not. It is the only authority: it is the final authority.” To be sure, Scripture is the highest authority and final word in the Westminster pulpit, the undisputed arbitrator in all matters. Assuming this same stance, MacArthur likewise affirms the absolute authority of Scripture. This noted expositor believes that this fundamental truth is rooted and grounded in the verbal, plenary inspiration of the Bible: “All Scripture, is God’s inerrant Word. 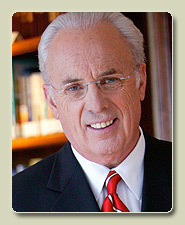 He writes, God divinely superintended the accurate recording of His divinely breather truth by His divinely chosen men.” MacArthur believes that divine inerrancy is inseparably connected with biblical authority: “Those God-given, humanly-recorded words became God’s written Word, inerrant and authoritative as originally given.” He further asserts, “If the Bible is infallible and inerrant, it must be the final word—the highest standard of authority.” Consequently, MacArthur argues that “the truth of Scripture…has the full weight of God’s own authority behind it.” Because the Bible is divinely inspired, it is divinely authoritative, a truth that mandates biblical preaching. “If the Bible is true,” MacArthur insists, “then it is also authoritative. As divinely revealed truth, it carries the full weight of God’s own authority. If you claim to believe the Bible at all, you ultimately must bow to its authority.” To this end, he states: “Preaching the Bible establishes the authority of God over the mind and the soul. When we preach the Word of God, our people understand who has sovereignty over their souls—it is God alone who reigns over their thoughts and their actions.” The Bible, MacArthur notes, “is not a book of suggestions. Its divine mandates are authoritative and binding. Those who treat it lightly place themselves in eternal peril. Those who take it seriously find eternal blessing.” Consequently, “The Bible claims complete authority over our lives.” This is to say, Scripture possesses supreme authority over every part of every life. Unquestionably, MacArthur’s firm commitment to the absolute authority of Scripture emboldens his preaching. In this, both Lloyd-Jones and MacArthur speak with one voice.